Four Paws Pet Place is a new facility in the Liberty area that provides premium quality pet boarding facilities, pet supplies for dogs, cats, birds and small mammals. 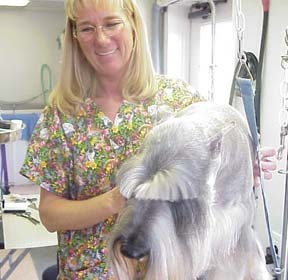 Limited grooming services are provided and quality is always emphasized. 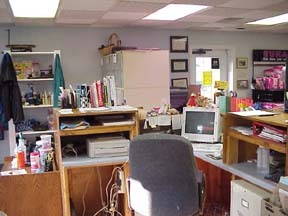 Mary is the owner / operator of Four Paws Pet Place. Mary has degrees in Animal Science, an MS in Agronomy and an MS in Accountancy. This type of work is a long shot from corporate tax accounting, her former career. Mary also does a considerable part of the grooming. Her job definately fits the category of a "full time job" as those of you that have driven by the facility on weekends and holidays can attest as she makes sure all of our boarders get their fair share of personal attention. This is Mary's veiw of the front as clients and their owners arrive. Mary and the rest of the staff have access to the hospital computer system and they use their own software to manage the arrival, care and departure of boarding animals. Walking dogs around Four Paws is a big job. Each boarder is walked at least two times each day. The dogs are usually walked around the perimeter of the hospital / Four Paws complex (3 acres). The dogs that don't have access to a run are walked at least 3 times daily. Animals staying at Four Paws have the opportunity for "Play Time" in the 1 acre play area. At times this is done (with owner approval) with Mary and my personal animals as playmate and other times with an employee supervising play (when needed). Pets can stretch their legs a little more in the play area than they can in the runs or on their twice daily walks. There is an extra charge for this service to compensate for employee time involved but it adds to many pets enjoyment of their time away from home. Pets can bring their own toys to play with in the enclosure. One thing that works out well is when pairs of pets get the opportunity to stretch their legs with each other in the play area. We take boarding dogs on long walks twice each day. It's nice to be able to take the dogs down through "The $10,000 Woods" even if I didn't like the price tag. I'm not so sure I like the "fertilizer" where I want to put my tent on my back yard camping trips but the dogs do enjoy it! 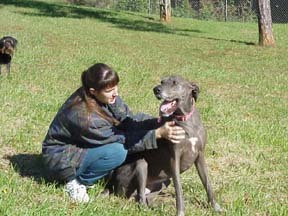 Here Rhonda is exercising Liza, a young, active Dane that can give Bully Boy (one of my dogs) a run for his money. This picture was taken before Rhonda became one of the regulars at FP but she looks like an expert at "supervised play-time" already! This is the retail area. 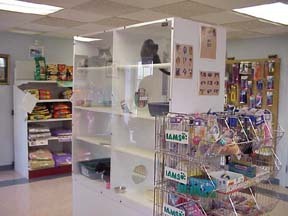 Mary tried very hard expanding the selection of products available.Since late 1998 Mary came to the conclusion that it would be difficult to compete with the pet supply super stores and the grocery stores in pet products and has cut back a little on those type of products. Boarding and grooming are the cornerstone of the income of Four Paws and the success of those parts of the business have allowed expeditures on new equipment to improve those services. 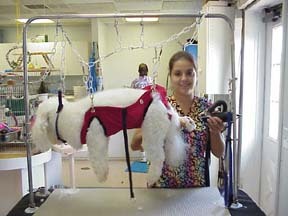 It's hard to appreciate that Teresa isn't "washing" a dog in this photo but rather drying a dog using the Davis Dryer. This dryer is a very high velocity dryer that removes water from the coat as much by blowing it off as by the effect of heat. It also removes lots of debris from the coat in the process. Teresa has the towel on her head to keep the debris from landing on her! 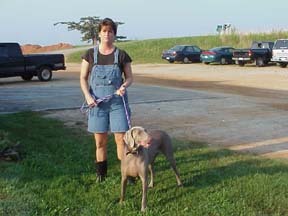 What the heck is Kristy Dummeyer doing here with this poor dog? All that I know about this thing is that it cost a lot of money! The Hanvey Slings made by Innovac Systems suspend the dog (particularly poodles) so that they can't (or more accurately don't want to) struggle to get away while their feet are worked with. It is just one of those things that don't have to make sense but when the dog is suspended they don't pay attention to having "poodle feet" done. Krysty doesn't work at Four Paws any more but the Hanvey Slings still do! The slings continue to help the groomers do their jobs better! 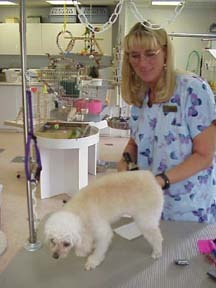 Mary is kept busy with grooming and it really makes it tough for her to get her business work done. Somehow we manage to get it done but lot's of days it's hard to see how your going to get there! 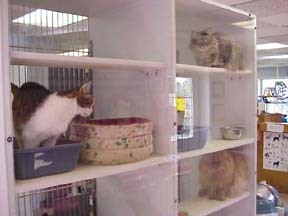 The indoor portion of the pet boarding area provides lots of space for animals. The animals stay on Dri Dek mats covered with a bathroom mat. The horizontal space that each animal has indoors is 4 X 5 feet or 20 square feet. It's hard to see in this picture but the first six sets of enclosures are "stacked" and the rest are full height. There are advantages to both. Obviously we can board more animals when the cages are stacked. However, the cages on top do not have direct access to an outdoor run. This means that dogs boarded in the upper level must be walked more often to assure that they get enough exercise and that they are out enough to eliminate when they need to. Small dogs and cats do quite well in the upper cages and even big dogs are not really cramped by the verticle height of 40 inches. Mary says that small dogs prefer the upper level since they are above the rowdy dogs as they come walking by. Cleaning is a little more difficult with the stacked cages. When we build the next building we will probably keep about the same mix of half and double height enclosures. Oh, by the way, that's (blank space), former employee, cleaning that run! The outdoor run are covered with a roof and are enclosed by a secure floor to ceiling security fence to prevent the possibility of escape. Much of the cat boarding is actually now done at the hospital. The condos pictured here are now at the hospital and it's a lot quieter there. 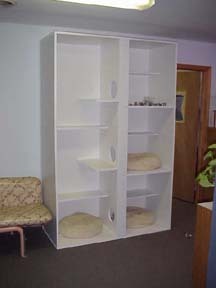 The Cat Condos at Four Paws come in two varieties. The condos pictured are of the commercial version and are quite nice. We have them up front in the merchandising area and people enjoy seeing the cats lounging around. 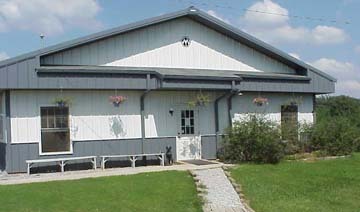 I personaly prefer the condos in the kennels described below. However, the plexiglass of these condos makes it fun to visit the boarding cats and they (the cats) get a lot of attention due to their accessability. A third style of condo is located at the hopital. The cats have plenty of room to move around and get exercise in the condos. That's especially true when all of the cats are from the same family as you see here where 4 cats from the same family get to board together. And this wasn't the whole family either. Dr. Bradley's other two cats were boading in the big cat condos in back and Miss Lillian was staying at our house (she's "special"). The Cat Condos at Four Paws are one of my designs so I guess you might expect that I would prefer them. This picture doesn't do them justice. The condos are two level, 4X4X4 feet in size and are usually packed with toys and exploring nooks that keep cats much happier than we could do in the regular cages and they have more room than in the commercial cat condos. We plan to expand the number of condos as soon as we can afford to. The commercial condos are nice but the aren't as big a and cost 3 times as much. The newest condos for cats are actually located at the hospital. We are experimenting with a new design that is less expensive than the commercial ones but that will not be in the same area as the boarding dogs. 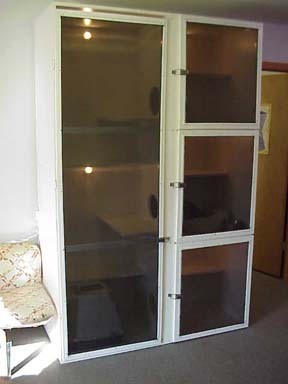 This condo is 8 feet tall and features a common exercise area for the three enclosures on the right. Low voltage lighting makes the animals more visible and allows us to observe for any problems more easily. The play area has 5 levels for exercise and a climbing pole for exercise for cats with claws. Non porus materials allow for disinfection between boarding animals as needed. Each enclosure has 2 levels to allow the cats to overlook their "domain". Location in a quieter area will be good for cats that are bothered by the presence of dogs. 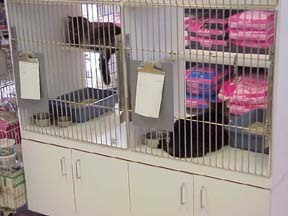 I will say that the cats that board in the large condos in the kennel at Four Paws don't seem to be as bothered by the activities of the dogs present as I am! This what the inside of the new condo's looks like. This picture was taken during the construction of the condos before the doors were attached.